This popular, 17 piece group was founded in 1999 by trumpeter, arranger and composer Vance Thompson. Since that time, the band has appeared on jazz festivals in the United States and Europe, released four critically acclaimed CD recordings and presented scores of concerts, many featuring world renowned guest artists. All members of the band are professional musicians, some with years of experience in other top flight jazz ensembles (Woody Herman Orchestra, Thad Jones/Mel Lewis Orchestra, Buddy Morrow Orchestra). 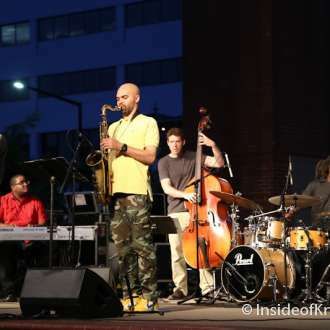 The group performs well over a dozen concerts each year, many featuring internationally recognized jazz artists, and has appeared at Big Ears, one of Knoxville’s highly-acclaimed music festivals. Artists who have appeared with the band include pianists Monty Alexander, Donald Brown, Hank Jones and Mulgrew Miller; saxophonists Seamus Blake, Don Braden, Vincent Herring, James Moody and Greg Tardy; trumpeters Bill Mobley, Marvin Stamm and Byron Stripling; trombonists Wycliffe Gordon and Paul McKee; bassist John Clayton; vibraphonist Stefon Harris; Hammond B-3 organist Dan Trudell; vocalists Deborah Brown and Annie Sellick. The KJO’s Valentines Jazz is for Lovers and Swingin’ Christmas concerts are extremely popular. Jazz On The Square is presented free May-August every Tuesday from 8-10PM on the outdoor stage at Market Square Mall. Bring a chair or blanket, or sit on the patio of one of the fine restaurants along the square.